NASA's advice for near-term meteor strike: "Pray"
At a House Committee hearing Tuesday, NASA administrator Charles Bolden Jr. was asked what America would do if a meteor similar to the one that hit in Russia on Feb. 15 was found to be on a path toward New York City, with impact three weeks away. His response? "Pray." At the moment, we might be lucky to get even three weeks warning. The United States and the rest of the world simply do not have the ability to detect many "small" meteors like the one that exploded over Russia, which has been estimated at roughly 55 feet long. Donald Yeomans, Manager of NASA's Near-Earth Object Program Office and the author of "Near-Earth Objects: Finding Them Before They Find Us," told CBSNews.com that there are a lot of these small meteors in orbit, and little early warning system in place to detect them. Yeomans said the most efficient way to find them would be a space-based infrared telescope. This has two benefits: One, the sun would not serve to prevent detection of some objects, and two, the infrared nature of the telescope would mean it would be effective in detecting them. 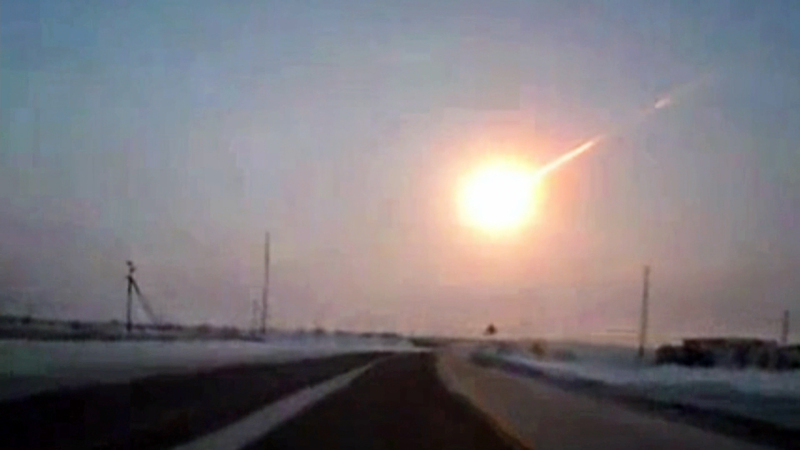 (Part of the reason there was no warning for the Russia meteor is that the sun blinded the satellites.) CBS News contributor and City University of New York physics professor Michio Kaku calls such a telescope a "no brainer," in part because it comes at the relatively low cost of a few hundred million dollars. "In Russia, if that asteroid had held intact for a few more seconds, it would have hit the ground with the force of 20 Hiroshima bombs," he said on CBS This Morning Tuesday, arguing the investment was worth it. Yeomans also called for ground-based wide field optical telescopes that could scan vast regions of the sky each night. At Tuesday's hearing -- before the House Committee on Science, Space and Technology -- Gen. William Shelton, commander of the U.S. Air Force Space Command, acknowledged that the United States had no idea the Russian meteor was coming. There is currently a project under way that would likely provide at least some warning for U.S. cities: The ATLAS, or Asteroid Terrestrial-Impact Last Alert System, is being developed to offer a one-week warning for a 148-foot meteor impact or a three-week warning for a 450-foot meteor impact. (The project, which involves eight telescopes, is scheduled for completion by the end of 2015.) Still, that's only enough time to evacuate residents and shore up infrastructure, not to head off the object entirely. The nation has done a far better job at tracking larger space threats than it has the smaller objects. "An object larger than one kilometer, which would cause a global problem -- we've found 95 percent of them already and none of them represent a problem in the next 100 years," said Yeomans. A hit from such an asteroid would be the equivalent of thousands of nuclear bombs going off, he said. "Civilization would survive probably, but not in the form that we know it." If such an object is discovered to be approaching Earth, the leading contender to address the problem would be to crash a spacecraft into it in order to slow it down and alter its course. "If you find it early enough, and you smack it early enough, you've got enough time," said Yeomans. The technology already exists to track and hit a space object: In 2005, NASA deliberately struck the Tempel 1 comet and photographed the impact. Still, for a large object, you'd need billions of dollars and, Yeomans estimates, at least a 10-year head start. "The technology is there, the question is do we have enough time to plan, build, launch and intercept these objects prior to an impact," he said. The good news is that, in the case of a large object approaching Earth, we would be expected to have decades of advanced warning. Despite the events of Feb. 15 -- when the meteor hit in Russia and, separately, an asteroid passed just 17,000 miles from Earth -- Americans should not anticipate a significant impact anytime soon. "The odds of a near-Earth object strike causing massive casualties and destruction of infrastructure are very small," John Holdren, senior adviser to President Obama on science and technology issues, told Congress Tuesday. "But the potential consequences of such an event are so large that it makes sense to take the risk seriously." NASA was budgeted just $20.5 million for its near-Earth object observation program in fiscal year 2012, and Bolden suggested Tuesday that Congress is not taking the issue seriously enough. "We are where we are today because, you know, you all told us to do something and between the administration and the Congress, the funding to do that did not - the bottom line is always the funding did not come," he said. An asteroid known as Apophis, which is about 1,000 feet wide and has the potential to wipe a nation off the face of the planet in a direct hit, is expected to come within 20,000 miles of Earth in 2029. Efforts are under way to attempt to mine asteroids for minerals - a project that would cost billions but could mean a massive return on investment - and a landing on Aphophis could be the first major step. The push to mine in space could, Kaku said, drive a public-private partnership that means improved detection of near-earth objects and a strategy to deal with them.